Lactate Scout 4 is the first choice of sports medicine and sport professionals around the world for the easy and reliable measurement of lactate whilst training out on the track, working hard in the gym or analyzing performance in the laboratory. Lactate Scout 4 has been ergonomically designed to be effectively used in the field as a training companion for coaches and athletes to determine optimum training programs, define training zones, and avoid inefficient training exercises. This hand-held lactate analyzer requires just 0.2 µl of capillary blood and returns results in 10 seconds. Up to 500 results can be stored on the device which also features, easy connection to heart rate monitors and a stopwatch function to aid in performance measurement. The features of Lactate Scout 4, such as the integrated step test function and Bluetooth connectivity, make it the most advanced lactate meter in the market. The intuitive and simple interface on the Lactate Scout 4 allows for easy navigation on the e-paper display ensuring excellent readability under changing light conditions and viewing angles. During endurance exercises such as long-distance running and cycling, when the demand for energy is high, lactate is produced faster than the ability of the tissues to remove it. As a result, lactate concentration in the blood begins to rise. 1. Remove sensor and place into analyzer. 2. Prick finger and collect blood by touching with sensor. 3. Result in 10 seconds. How long does it take to perform a test using Lactate Scout 4? Once the blood sample has been inserted, results are reported within 10 seconds. Just 0.2 μl is required from a sample taken from a finger or earlobe. 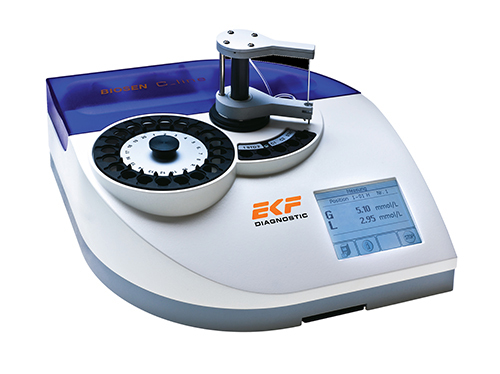 The Scout measurement system operates on the basis of enzymatic-amperometrical detection. This means that the device reads the electrical signal created by the reaction of the sample with the biochemical reagent on the inserted sensor. This signal corresponds directly to the lactate concentration of the sample. The Scout uses disposable ‘Sip In’ sensors which automatically take up the precise required sample volume. The sensor must be inserted into the device before the sample is taken because the biochemical reaction starts as soon as the blood comes into contact with the sensor allowing the reading to be taken immediately. It is not possible to get readings from pre-filled or used sensors. 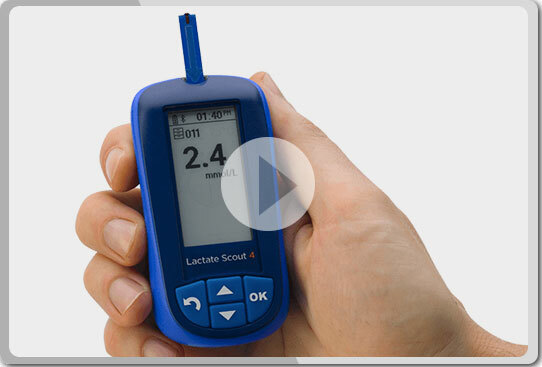 What sample types can be used in the Lactate Scout 4? The ‘Sip-In’ sensors are designed specifically for human whole blood. Different samples, such as centrifuged blood / serum, chemical liquids and buffer solutions have different characteristics in their viscosity and biochemical content. For this reason, sensors react much more sensitively to interferences in such samples. After sampling whole blood changes its characteristics within seconds, so immediate sampling with fresh blood is highly recommended. Remains of disinfectant liquids, blood circulation-stimulating crèmes, dried blood and sweat must be always removed with clean water from the sampling area before taking the sample. Sample quality plays a very important role in the accuracy of the result. To minimise external influences we recommend that the same sampling area is used throughout (finger tip or ear lobe). Different parts of the body provide different results because of differences in blood circulation. What power supply is required for Lactate Scout 4? 2 CR2450 batteries will perform approximately 1,000 tests. Data storage and settings will not be lost when batteries are replaced. How should the sensors be stored? Avoid storing the sensors in direct sunlight or at high temperatures for long periods. For long term storage the sensors should be kept in the closed vial in the refrigerator at -18°C to +8°C. The sensors must be removed from the refrigerator 20 minutes before use so that they attain the same temperature as the device. The reagent is very sensitive to sunlight and humidity. It is recommended to only take the required number of sensors from the vial for immediate use. After first opening the vial of sensors, the storage stability is three months or until expiry date if it is sooner. Afterwards, inaccurate measurement results can occur. Sensors can be kept at ≤25 °C for max. 30 days in the closed vial. Always transport the device and sensors in suitable conditions. Protect them from direct sunlight. Is it necessary to calibrate the Lactate Scout 4? Sensors are pre-calibrated. In order to synchronise the sensors with the device a two-character calibration code (printed on the vial label) must be entered in the device when prompted. After 25 measurements the device reminds you to check the code settings with the used sensor vial for confirmation or correction. Is there a power save function? If there is no user activity during five minutes, the device automatically switches to stand-by mode. If no sensor is inserted for more than five minutes the Scout switches off. To reactivate the device, simply press the OK button. Can the stored data be transferred to a PC? The integrated Bluetooth® Low Energy technology provides an easy way to send data to your PC and connect to heart rate monitors. EKF offers software solutions for fast and intelligent data analysis, suitabe for amateurs and professionals. What are the performance characteristics of Lactate Scout 4? Due to the high number of potential interferences in lactate measurement and the specific characteristics of different analysers no standard measurement has been defined. The characteristics and trends of lactate curves (given from step tests) are much more meaningful than a comparison of single/absolute values. The Lactate Scout 4 compensates for the influence of low (20 - 50 - 70%) hematocrit levels on the lactate reading. This leads to a significantly increased accuracy in these ranges. Studies have shown that the precision depends on the lactate concentration. At blood lactate concentration 0.5 - 6.7 mmol/L standard deviation is ≤0.2 mmol/L; at 6.8 - 25 mmol/L CV is ≤3%. At blood lactate concentration 0.5 - 7.5 mmol/L standard deviation is ≤0.3 mmol/L, at 7.6 - 25 mmol/L CV is ≤4%. The Lactate Scout 4 is calibrated to whole blood. Therefore, measurement results obtained with the Lactate Scout 4 cannot be compared to results of plasma-calibrated laboratory tests. The Lactate Scout 4 shows a good correlation with the whole bloodcalibrated lactate analyzer EKF Biosen. Does the device function in extreme temperatures? Lactate Scout 4 operates in a temperature range of 10 - 45°C. There is an internal temperature sensor in the Scout and a warning symbol will flash if the sensor detects temperatures that are too high or too low. The device and the sensor must reach the same temperature. What effect does sweat have on readings? Sweat contamination can deliver significantly higher values of lactate at rest or levels of moderate effort. Sweat should only be removed with water. Cleaning with alcohol swabs is insufficient and may even dilute the blood sample. After cleaning, the puncture area must be dried. A water spray bottle can be purchased seperately. High resting values may also be caused by general stress, metabolic or health problems or even by diet. Usually, the values will come to a ‘normal’ level (about 2 mmol/L) during the first training steps. If the values remain high or significantly increased the step test should be aborted and a medical check of the user should be undertaken.